Photo courtesy of the Mepham Alumni Association. who desired to pursue arts-oriented career goals that require further academic or non-degree professional education/training in fields such as: music, dance, painting/illustration/sculpture, theater.cinematography, creative writing, fashion design, interior design, architecture, and computer graphics. .thus the motivation for the establishment of the Mobius Arts Scholarship program at Mepham. Early this year several members of our class worked with Mark to develop criteria for the Scholarships and implement the program. Assistant Principal Jennifer Carne agreed to help us gain Bellmore-Merrick Central High School District Board of Education approval (which was granted), and to advertise and promote the Scholarships within the Mepham community. Students were notified of the Scholarships availability in late February, with an applications deadline of March 31.
write an essay describing plans for her/his academic/professional education/training and career goals to include a summary of experiences and accomplishments to date. prepare a budget which projected how the Scholarship funds would be utilized. provide references from three individuals who could attest to the applicant's abilities and potential for success in the selected field(s) of study. In addition, each applicant was encouraged to submit supporting materials such as portfolios of art and design presentations, samples of written works, recordings of performances in music/dance/theater, plus any other evidence of creative endeavors. Six students applied for a Mobius Arts Scholarship, with two applicants expressing interest and providing evidence of achievements in more than one field. All students submitted supporting materials in a variety of formats. Seven individuals served on a committee to review the applications and reached consensus on the winners. Six were '54 classmates: Lance Blackshaw, Bob Ferrigno, Frank Gobetz, Al Haggerty, Bill Hall, and Carol O'Keefe House. The seventh was Paul Mobius, Mark's brother and Mepham Class of '49. 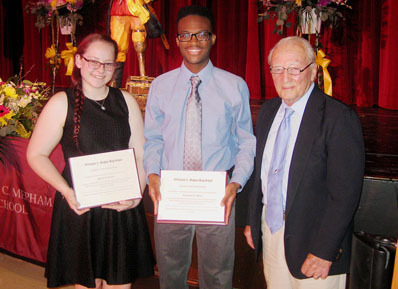 The 2017 Scholarship winners were Helena Bradley and Immanuel Mellis. They received their awards at the Mepham Senior Awards assembly on June 1. Paul, a Shelter island resident, was the presenter. The reviewers were 'wowed' by the talents and the accomplishments exhibited by the applicants. Selecting the two winners was a challenging task. Some information about Helena and Immanuel follows. Helena Bradley will be majoring in Digital Art and Design at Long Island University's Post campus, where she already has received scholarship assistance. She may attempt to incorporate a second major in photography. After college, she hopes to work in areas such as designing posters, websites, and t shirts. In addition, she would like to open a photo studio that specializes in film, while also continuing to do digital work. Helena's portfolio consisted of samples of her photographs (and her ability to 'photo-shop' them) to create the images she wished to portray, and visual pieces utilizing a variety of media that displayed her drawing, painting and sculpture talents. She was a member of the National Honor Society at Mepham and the National Art Honor Society, and was recognized for her artistic abilities by being awarded a scholarship from the Art Supervisors Association, one of 42 students in Nassau and Suffolk counties to receive this honor. Helena's references also cited her willingness to assist fellow students with their art class activities. Immanuel Mellis will be majoring in composition at the SUNY Fredonia School of Music, where he will be enrolled in the Honor's Program. His goal to diversify his composition skills to enable him to write music for various mediums such as film, theater, opera, concerts, commercials, and video games. He'll also seek to minor in music production to become more rounded in the creation of these mediums. Immanuel already has been widely recognized for his composition abilities, having his works professionally performed at venues ranging from Mepham to a New York State Student Music Association (NYSSMA) event in Rochester as winner of the NYSSMA Call for Compositions competition, and the New York Summer Music Festival in Oneonta. One judge described Immanuel as "having a musical language that is all your own". Always eager to learn and be involved in outside studies, he is also a violinist and a new student of the viola. Immanuel's application portfolio contained both manuscripts and audio performances of his compositions for various instruments, ranging from solos to full orchestra. Spring Luncheon featuring Mark and Paul Mobius, award winners, their parents, and a tour of Mepham.